Over the last few years the 7 pillars framework has proved to be comprehensive, robust, practical and useful. 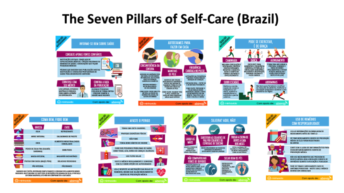 Each pillar describes in middle-range terms a set of activities that every individual should undertake; collectively the 7 pillars describes the entirety of self-care from the perspective of the self-carer. Fundamentally, the 7 pillars represents a “demand-side” perspective distinct from a “supply-side” approach of governments, health professionals and health services. It is known that unhealthy behaviours – smoking, excess consumption of alcohol, poor diet and insufficient exercise – tend to “cluster” together in individuals and in particular parts of a population. An interesting issue is the extent to which healthy behaviours in the seven pillars also cluster together. One implication is that if a person is motivated towards one healthy behaviour (e.g. quitting smoking), then they may also be more strongly disposed towards others healthy behaviours, such as losing excess weight or exercise. These potential synergies are important, in part because policymakers (at least in the West) tend to focus on individual interventions rather than considering self-care as an holistic practise.